In this era of “Big Data,” institutions of higher education are challenged to make the most of the information they have to improve student learning outcomes, close equity gaps, keep costs down, and address the economic needs of the communities they serve at the local, regional, and national levels. This book helps readers understand and respond to this “analytics revolution,” examining the evolving dynamics of the institutional research (IR) function, and the many audiences that institutional researchers need to serve. Internally, there is a growing need among senior leaders, administrators, faculty, advisors, and staff for decision analytics that help craft better resource strategies and bring greater efficiencies and return-on-investment for students and families. Externally, state legislators, the federal government, and philanthropies demand more forecasting and more evidence than ever before. These demands require new and creative responses, as they are added to previous demands, rather than replacing them, nor do they come with additional resources to produce the analysis to make data into actionable improvements. Thus the IR function must become that of teacher, ensuring that data and analyses are accurate, timely, accessible, and compelling, whether produced by an IR office or some other source. Despite formidable challenges, IR functions have begun to leverage big data and unlock the power of predictive tools and techniques, contributing to improved student outcomes. 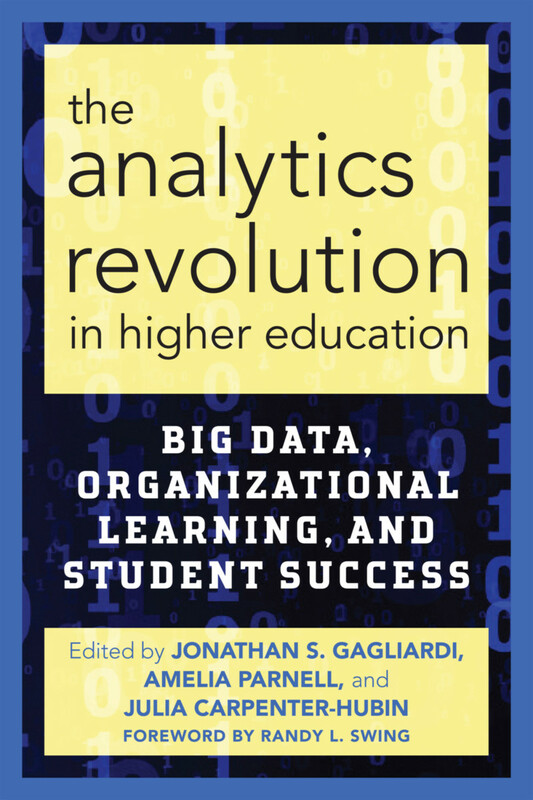 "Comprised of thirteen erudite, impressively informative, and exceptionally thoughtful, thought-provoking articles by experts in the field of big data management and education, The Analytics Revolution in Higher Education is an extraordinary and highly recommended addition to both college and university library Education & Data Processing collections and supplemental studies reading lists." Jonathan S. Gagliardi is the Assistant Vice President for Analytics, Policy, and Strategy, Lehman College, The City University of New York. He previously served as the Associate Director for the American Council on Education Center for Policy Research and Strategy, and as a Visiting Fellow for the Rockefeller Institute of Government. Prior to that, Jonathan was a Chancellor’s Fellow of the State University of New York System and the Deputy Director of the National Association of System Heads. In these roles Dr. Gagliardi helped create and implement national completion initiatives aimed at scaling out evidence-based practices that promote student success. Jonathan was a co-principal investigator for the multi-year research project, Meeting Demands for Improvements in Public System Institutional Research, which focused on examining and transforming the IR function. Dr. Gagliardi previously served the Kentucky Council on Postsecondary Education on matters related to research, economic, and community development, efficiency and innovation, and data governance and stewardship. He is recognized for his expertise in innovation and entrepreneurship, serving as an Advisory Board member for the Association of Public and Land Grant Universities Commission on Innovation, Competitiveness and Economic Prosperity, and for the Center for Leadership and Service at the University at Albany. Dr. Gagliardi holds a Ph.D. in Higher Education Policy and Leadership, M.S. (Higher Education Policy and Leadership) and B.A. (history and sociology) from the University at Albany. Jonathan’s research has focused on innovation, organizational transformation, the intersection of higher education and the workforce, and student success. Amelia Parnell is Vice President for Research and Policy at NASPA – Student Affairs Administrators in Higher Education, where she directs the Research and Policy Institute (RPI), which links research, policy, and effective student affairs practice in support of student success. Amelia is leading NASPA’s examination of several critical higher education issues, including colleges’ use of emergency aid programs to address student needs. Prior to her arrival at NASPA, Amelia was director of research initiatives at the Association for Institutional Research (AIR), where she conducted two national studies related to future directions of the institutional research function. Her current research portfolio also includes studies on leadership attributes of college presidents and vice presidents, documenting and assessing co-curricular learning, and assessment and evaluation in student affairs. Amelia is an advisory board member for the DC Public Schools’ Urban Education Leaders Internship Program Alumni Board and an advisory committee member for Lumina Foundation’s Beyond Financial Aid toolkit. Amelia holds a Ph.D. in higher education from Florida State University and masters and bachelor’s degrees in business administration from Florida A&M University.